He might be a bit thin, lacking some hair and is not really the conversation type, but Stanley is Claire Olds’ best uni buddy. 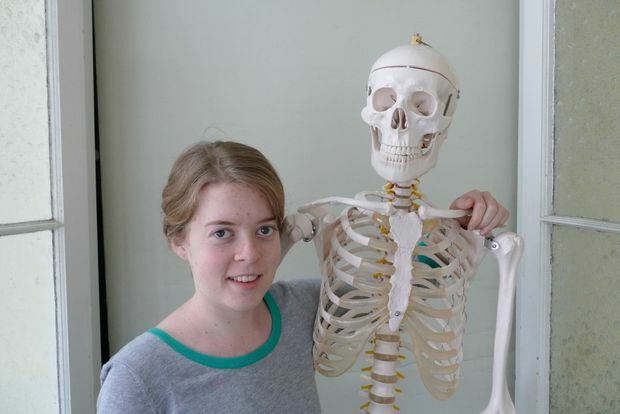 When I heard the story this week about our physiotherapy student, Claire, being photographed around town with her plastic skeleton, Stanley, buckled into the passenger seat, I thought it was hilarious – especially since it landed the pair in the Bundaberg Newsmail. You see, Stanley was a birthday present for Claire who finds skeletons really useful to understand how muscles connect. So, she takes him to Bundy campus each day from her home in Maryborough. However it seems as though Stanley has drawn a bit of attention to the pair and was captured on camera while stopped at some traffic lights recently. Claire told the News Mail: “It’s easier to put him in the front seat, otherwise I’d have to take his legs off to put him in the boot”. I can understand Claire; he deserves more than that. After all, he’s not just any bag of bones – he’s Stanley. I can’t wait to meet him when I’m next in Bundy.